I've been trying to figure out how long I've been an admirer of my lovely friend Sonia, her wonderful nature photography and beautiful handmade work. Not to mention her fabulous cat, Gary (he is a star and certainly no stranger to this blog!). 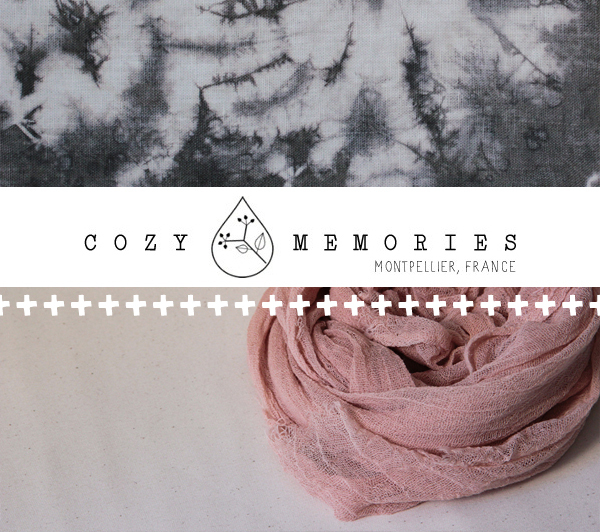 I know I've been following her beautiful Flickr pages for a few years now, but for the last year or more I have been able to get to know her a wee bit better through Facebook and follow her eco-friendly business label, Cozy Memories, as it grows and develops. Sonia is not only a great photographer and crafter but also an incredibly talented natural dyer. The roots of her inspiration are deeply planted in nature and showing respect to her environment. Much of which is sourced locally, around her home in the south of France (lucky lady!). While out and about with her family she is always on the lookout for abundant plant materials for her next dye bath and documents her finds with her camera. "I dye natural fibres (cotton, silk, linen, wool) with plants (leaves/flowers/others), fresh or dry, that I have picked or collected myself in nature, after having checked online & in books that they are not endangered or protected species. My favourite plants to use are the ones that grow abundantly here (ex: fennel), the invasive ones (ex: ivy) or the ones that some (not me !!) would call "weeds" (ex: ribwort plantain) I also dye with materials found in my kitchen, such as onion skins & avocado skins." Her eco-friendly business approach doesn't stop there either. From creation to production to sales and shipping, Sonia carefully considers the environmental impact of every stage of her business. 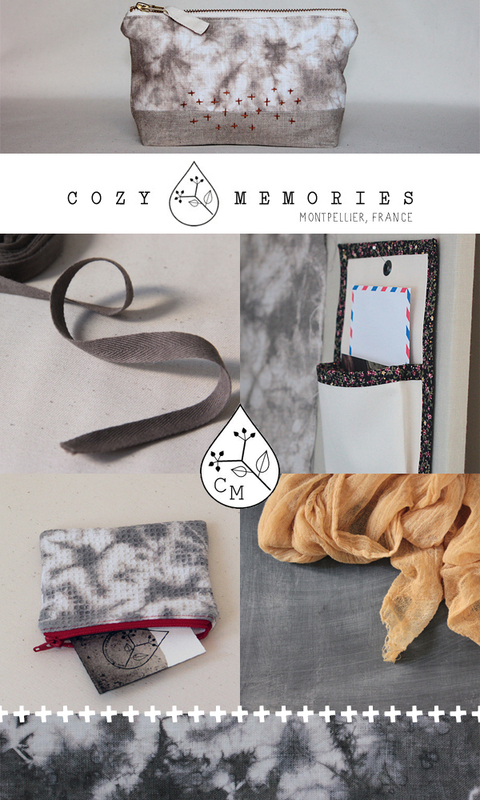 She works with responsibly sourced organic or vintage fabrics (linen is one of her favourites to work with); naturally dyes much of those fabrics and the threads she uses; packages her products in handmade pouches or recycled / recyclable materials and has spent many hours sourcing eco-friendly padded envelopes for shipping. Oh and I can tell you, her parcels are delight to open when they arrive! Above is a wee order I placed before the holidays... see what I mean? Gorgeous! The scarf was on my festive shopping list, a beautiful cotton gauze dyed with Sicilian sumac leaves which gives a gorgeous shade of purple-grey. While the sweet pouch, made with a vintage folk fabric, and one of Sonia's perfectly designed linen card holders were two things I crossed off my wish list! The whole experience of buying Sonia's work is what buying handmade should always be like. Knowing you are supporting a small and independent designer who is committed to creating beautiful work while being responsible to the environment. Not to mention the pleasure of interacting with such and open and friendly person who delivers great customer service. Sonia, you are an inspiration my dear... thank you! Sonia is perpetually dyeing new fabrics and crafting them into one-of-a-kind pieces, so to keep up to date with her latest work by staying tuned to her 'Naturally Dyeing' blog and Facebook pages for all the details. Sonia makes the most amazing things. Beautiful post! Sonia is wonderful. Love her and her creations. Sonia is an amazing artist and person!Lovely report Emma!AriadnefromGreece! This is such a beautiful article about a talented maker. And you got Sonia exactly right! 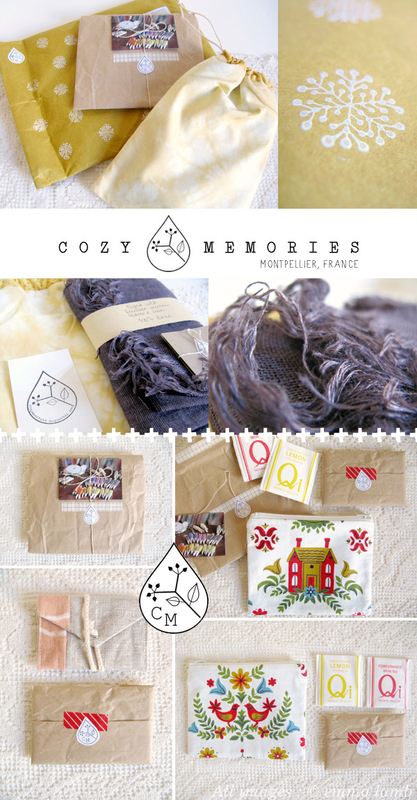 I love receiving Sonia's thoughtfully put-together packages, with the loveliest crafted items inside. Sonia is a treasure. What everyone else who knows Sonia has said, not only is she an absolute delight but so are her packages. Fantastic and well deserved review of Sonia's work. Big fan of her photography and work here too!